The Afrique sur Bièvre association, located 3 km south of Paris, aims at the promotion of the cultures of the African continent through its cinematographies, especially by the organisation every year since 2007 of the Ciné Regards Africains Festival. In November 2016, that will be its 10th issue. 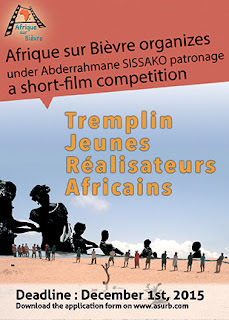 For this occasion and within the framework of its objectives, the association has created the prize “Tremplin jeunes réalisateurs – Ciné Regards Africains” in order to boost the careers of young film-makers who have just completed their university studies in African cinema schools. The competition is patronized by Abderrahmane Sissako: it is a great honour both for the competitors and Afrique sur Bièvre. Competition is open up to 1st December 2015. Rules, regulations and application form are available on www.asurb.com. Results will be announced not later than 31st March 2016. This award is designed to honour a graduation film directed by a student in an African film school, in each of the two categories: documentary and drama. Both prize-winning films will be screened during the “Ciné Regards Africains” festival in November 2016 and both directors will be invited to take part in this event. The purpose is to facilitate exchanges with the public, cinema professionals and students. Event shared via the Institut Francais Afrique du Sud.